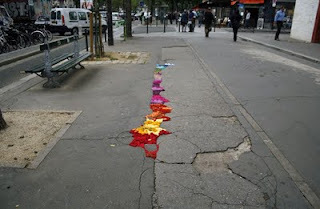 Juliana Santacruz Herrera decided the streets of Paris were too gloomy and needed a little fresh touch. With these in mind she came up with the concept of decorating the potholes of the city using colorful strips of fabric. 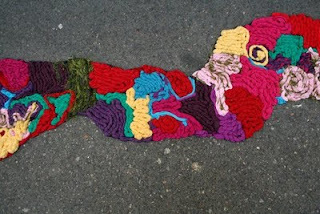 These were placed randomly in shallow breaks and cracks, creating a fun and colorful change in the landscape. The artist’s visual intervention brings a happy touch to the gray streets of Paris and creates a fun and appealing contrast with the dark cement. But what if we were to take this idea further? If you like how this photos look, perhaps you could use them as a source of inspiration when it comes to patching up your own courtyard, patio and so on. Sounds practical?